In high school, he split two helmets apart to create one extra-large one and got a waiver from the MIAA. Alex Chu has a big problem he just can’t seem to wrap his head around. “There are reasons to be on the sideline, I just happen to have a big head,” Chu said. He’s not talking about his ego, even though he was a standout lacrosse goalie at Nipmuc Regional High School and a highly sought after player by Wheaton College, which is located in Norton, Massachusetts. Alex Chu is struggling to find a lacrosse helmet that fits his large head. “He’s a big part of our program. He was a heavily recruited freshman and one of our four goalies,” Wheaton Lacrosse Coach Kyle Hart said. In high school, they split two helmets apart to create one extra-large one and got a waiver from the MIAA. In college, helmets need to be compliant with the National Operating Committee on Standards for Athletic Equipment and the three main lacrosse helmet makers don’t have one that fits Chu. The large helmets on the shelves fit a 24 inch circumference head, which works for most players. But Chu's head measures more than 25 inches. It’s now a mere inch that blocks him from tending the goal at Wheaton College. “Lacrosse is kinda everything to me. I just want to play,” Chu said. 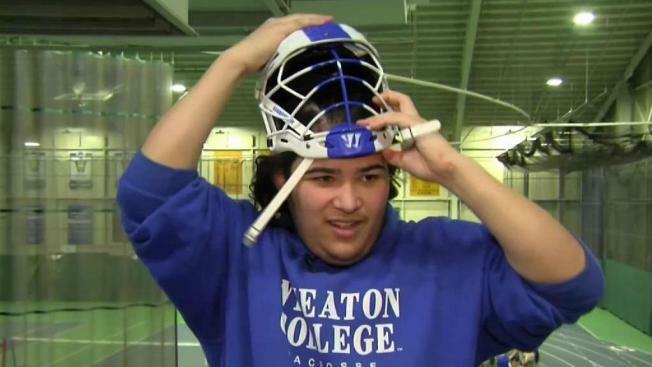 The Wheaton Lacrosse team uses Warrior helmets. Chu and his coach say the company is sending a new style helmet the company just unveiled, and they hope it will fit and perhaps even get it in time for the first game of the season Wednesday.